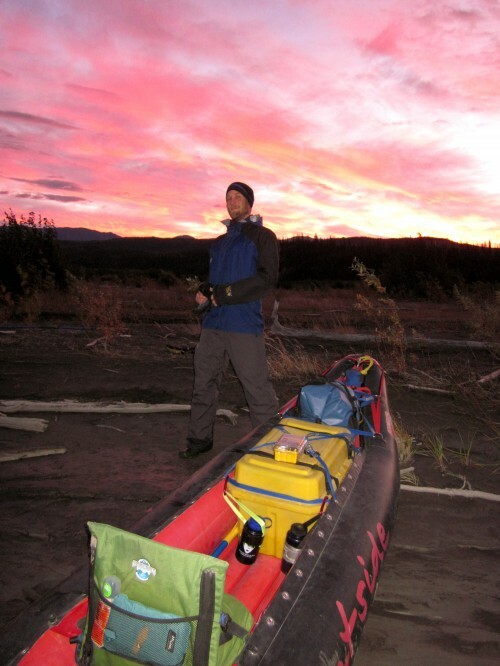 Cody Johnson (PFS Alaska Regional Planner) completed a fall-season float 250 miles down the Copper River in southeastern Alaska last year. The Copper, famous in the lower 48 for its rosy salmon, borders the Wrangell-St. Elias National Park, draining the Wrangell and Chugach mountains to the Gulf of Alaska. The massive waterway, among the top ten largest rivers in the U.S., slips through some of the most gorgeous and varied country in one of our most gorgeous and varied states. Cody and wife Amy Breen spent 10 days exploring the river for their first anniversary and kept a journal of their adventures, which we are pleased to present to you here. Enjoy! Put in at the Slana bridge ~10:45, take out at the confluence of the Copper & Christochina rivers. Overcast most of the day, but calm winds. Nice day on the water, ~30 river miles on the first day. We enjoyed a scrumptious oatmeal breakfast with Tracy & Cory before bidding them farewell at the Slana River Bridge. We’re so grateful to them for helping with the shuttle from Fairbanks. Soon after, we inflated the boat, packed, and were off on the Slana River. The Slana quickly met the Copper River which was swift, silty, and much braided. Cody and I traded leading through the braided sections (often dodging down tress in the water). The wisdom for the day came from the experience. When you are traveling in the main river channel it isn’t always obvious, but when you are not in the main channel it is infinitely apparent. Moral: When moving forward effortlessly don’t change your path. About 15 miles into today’s run the river stayed to one main channel and the remainder of the day we moved quickly down river. Overall we traveled 30 miles in ~6 hours or ~5 mph. We are camped at a wonderful spot at the confluence of the Christochina & Copper Rivers. It’s nice to be tented within a bear fence. 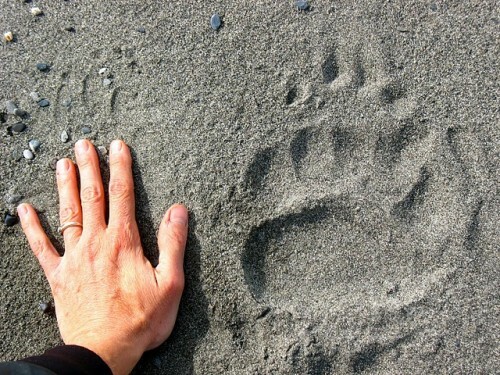 I hope I can sleep well and not fret too much about bears. The animal tracks we observed near camp are moose, thankfully. Awesome husband who gave me his puffy sleeping bag. Got on the water ~10:00 at the confluence of the Copper & Christochina rivers. Took out ~16:30 just past the confluence of the Sanford & Copper Rivers. Another 30-mile day with overcast skies but luckily no rain. River was wide and braided most of the day, but consolidated into a swift moving single channel just before the Sanford confluence. Another 30-mile day. Started ~10:00 at the Sanford confluence took out ~16:00 just down river of the Tazlina, Copper confluence. The weather isn’t getting any better. Overcast morning, rain midday, and one hell of a head wind in the afternoon. Lots of fish wheels as we passed the villages of Gulkana and Tazlina. The river is now becoming less braided and is a swift single channel with sections of large rapids. The rapids have not been too challenging and it has been a nice change to be in bigger, faster, water. The river has followed a large cliff for most of the day on the west with very interesting stratigraphy. Bald eagles have been abundant all day, it seems that they are often in pairs. If you were the wood, I’d be the fire. & if you were the river, I’d be the beaver. Well after much fretting on my part, um…well the “large hydraulics” Jettmar writes of between the Gakona & Tazlina rivers were fairly benign. The river was swift with lots of waves and fun fast moving water, but any obstacles (strainers & rocks) were easily avoided. I am pooped after a long day on the river with wet feet. More tomorrow & hopefully sun tomorrow too. Another 30-mile day. We are at river mile ~120 and half way there. The river has been more fun by the day. There are very few braids and lots of fun rapids to play around in. We got a bit of a late start today, sleeping in until 08:00, and we were not on the water until ~11:00. But, the river was moving quickly and it was one of the easiest days we’ve had on the water. Lots of fish wheels and camps along the river, but we are diverging from following the road so I am hoping to see less people over the next few days. After a tumultuous night, we woke to high winds from down stream. We had to reorient the tundra tarp to accommodate the shift in the wind (and intensity). Once better situated, we enjoyed a lazy morning of delicious hash browns & various camp chores. The BIG QUESTION now is: To say or go? Pinned down by wind all day. Zero miles on the water. We’re going to try an early start tomorrow to make up for lost time, and hopefully get some miles in before afternoon winds kick up. We’re keeping our fingers crossed for less wind. Cold and rain can make for uncomfortable days on the water, but wind stops progress all together. Early start and on the water by 07:00. Still windy and it was a hard fought 30 mile day. For most of the day all we could do was rudder to keep the bow of the boat into the wind, as paddling was almost completely ineffectual. We were hoping to get to an NPS campground just past the McCarthy Bridge at Chitina. But, the wind pinned us down to an island in the Copper <1 mile from the bridge. We had to line the boats and island hop to get to some alders for cover. The wind was so strong it actually picked up my fully loaded boat and flipped it end over end. Luckily it was tied down! We are now camped on an island with the bridge in view and lots of aircraft flying overhead as we are just down river from the Chitina airstrip. We are going to try for another early start tomorrow, and again keeping fingers crossed for less wind. BEAUTIFUL day! Beautiful. SPECTACULAR landscape. We woke early (4 am – ouch) to less wind and decided to go for it this morning. Although it was less windy than yesterday it was still windy enough to make paddling difficult as we set out for Chitina and beyond. Thankfully, the wind settled down as we entered Wood Canyon and (gasp, wait for it) the sun came out. Before we committed to the canyon, Cody & I experienced a humbling moment as in the wind and fast moving water we were both sucked into an eddy/whirlpool. I was managing o.k. until out of nowhere Cody & his boat launched into mine as we simultaneously spun out of control in the whirlpool. Thankfully after a moment the river spit us back out into the main current and we were on our way. Perfect day on the water! We rose early (4 am) to be on the water by first light (06:30). After losing the battle with the wind on the previous day we were hoping that an early start would get us out before the wind picked up. It paid off, and even though the wind was still blowing as we approached Chitina it died almost completely as we approached Wood Canyon. Our persistence through the wind and rain over the previous six days was handsomely rewarded today as the scenery was magnificent and the weather perfect. As we exited Wood Canyon I was startled by a seal that popped its head out of the water just off my bow, and farther down river another seal playfully surfaced and dove around Amy’s boat. All in all we paddled 35 miles today with calm winds and sunshine; it felt almost effortless. We have a wonderful campsite at the confluence of the Cleve & Copper Rivers. Both Amy and I are looking forward to some well deserved sleep with no alarm set this evening. Now that the Copper has joined with several large rivers (Chitina, Kosina, Sanford, etc.) and is less braded, sticking to a single channel, the water has considerably more power. All maneuvering now has to be considered well in advance to account for the movement of the current. 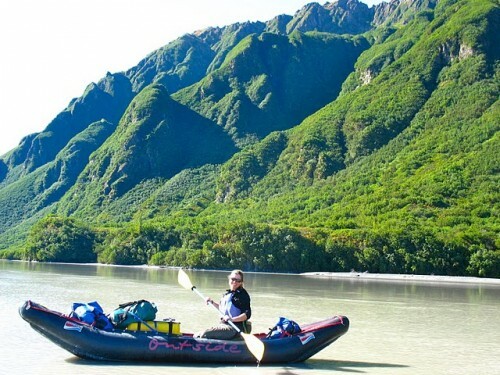 Today Amy & I were both sucked into a large whirlpool just down river from Chitina. We both thought we had given it a wide enough berth, but were unable to paddle against the current. It was a bit dicey, but luckily after a couple of go ‘rounds it kicked us back out into the main current. Wood Canyon had a bit of pucker factor on the approach, but turned out to be a nice section of river with steep canyon walls coming right out of the water. There were a few hydraulics as the river eddied around protrusions from the canyon wall, but staying in the middle of the channel kept us out of harms way. Outside of Wood Canyon the view of the Chugach Mountains was nothing short of spectacular. Spirit Mountain and several other unnamed peaks seemed to rise directly out of the river channel, and steep mountain slopes were lush with alder and black cottonwood. Glaciers are pouring out of the mountains with stream channels creating amazing waterfalls. Our beautiful weather from yesterday was short lived. We slept in this morning and got on the water ~10:45. There was a bit of a breeze when we put in this morning, but by noon it was a full-blown gale. Amy and I were forced to island hop (again) to the west shore to find cover, and set up camp after only 15 miles on the water. We scrambled to set up camp & get out of the wind and rain, but low and behold by the time we had camp set up the weather system moved to the east of us and it ended up being a nice afternoon. I believe we are back to the early morning, on the water by first light, schedule from here on out. Although the weather was less cooperative today the scenery was still spectacular. We passed the most magnificent waterfall I have ever seen early in the day, and a seal was bobbing playfully in the water as Amy and I sat on an island for lunch. We are now approaching some glaciers that calve directly into the Copper River, and we are excited to see such an event. We set up camp today near the abandoned village of Bremner. The village must have been quite the beautiful place to live back in the day. It sits beneath Ginny Creek, which cascades down the hillside to where it meets the Copper River. We’d like to venture to seek out the former village but it sits ~1 mile away through tall shrubs and cottonwood, and I am too weary of bears to stumble blindly through the tall vegetation. Amy – hash browns and the weather temporarily improving mid-afternoon. Cody and I are both looking forward to the day and hoping for low winds and (fingers crossed) some sun. Another early start paid off. We were on the water by 07:00 and had a great day on the water. Winds picked up just before we entered Baird Canyon, but were calm as we exited in Miles Lake. Seals were everywhere, too numerous to count. It was fun to watch them bob and dive around our boats. The day started off with the Copper in a wide slow moving channel as we paralleled the Bremner River. Progress was slow but it was a nice morning. We checked out the massive sand dune that separates the Copper & Bremner Rivers. It was an amazing site and both Amy and I were thankful that we were not stranded on the sand dune during the windstorm the day before. After a lot of anticipation about the Abercrombie rapids there were much ado about nothing, not even modest rapids compared to several unnamed rapids we have already run. Miles Lake, however, was beyond compare. Massive icebergs from the Miles Glacier fill the lake, and it felt as if we were paddling through a glass of ice water. The Miles Glacier, to the left as we entered the lake, is massive and impressive, defying description with words. However, the Childs Glacier is nothing short of terrifying. The face of the Childs Glacier stands 300 feet tall as the Copper River exits Miles Lake. It seems to be constantly calving massive icebergs into a narrow channel sending out huge tidal waves. We have to paddle ~2 miles along the face of the glacier tomorrow. This will no doubt be the most dangerous part of the trip. If the glacier calves as we paddle by we will be at the mercy of the tidal wave, and likely thrown against the rocks on the opposite shore. As I lay in our tent listening to the thundering noise of the ice calving off of the glacier I am more than a little concerned about our safe passage around the glacier. We arrived at Flag Point at ~2pm today. We did it! 245 miles of paddling the Copper River in 10 days; Cody and I are thrilled and I’ll admit I am a bit in disbelief that we have reached the end of our trip. We awoke today at 5am and were on the water at 8:30am. We had a slow start to the morning as Cody had to fuss & repair a clogged Whisperlite. Thankfully, Cody was able to get it going and we enjoyed abundant oatmeal and all the fixins to start our 20 mile day. At the start of the paddle we had to pass the terminus (or snoot) of Childs Glacier. We had listened to the glacier calve and rumble the previous afternoon and night, so we both were poised to paddle quickly past the glacier and beyond. We rounded the corner from the Million Dollar Bridge to the glacier snoot and encountered one of the largest rapids thus far. It was fun and fast and solid class II-III. Cody remarked that there was no mention of this rapid in Karen Jettmar’s river guide. As we continued past the glacier, it became apparent the calving portion of the glacier directly in the river was ~1/4 mile long. Again we had psyched ourselves up for a much larger challenge than actually was necessary. Even so, Cody and I were grateful once we paddled beyond the glacier’s terminus. We now sit at Flat Point drying the boats and gear awaiting our pick up by Cordova Coastal Outfitters. The day is brilliant with blue skies and sun and the view of the Chugach Range is phenomenal. We’ve been entertained thus far by the locals navigating the river and sand dunes by 4-wheeler and a hovercraft that passed by traveling upriver. We made it! 250 miles over 10 days, running almost the entire length of the Copper River. Our last day was gorgeous with bright sunshine and a vast expanse of delta to paddle. We hit Flag Point ~14:00 after a great day on the water. Paddling in front of Childs Glacier was nerve racking but a phenomenal experience. Following the glacier were two sets of rapids that were some of the most fun of the entire trip. After arriving at Flag Point we were able to dry out wet gear in the sun, and after following a few hours of kicking back I thumbed us a ride into Cordova. We were picked up by a wonderful woman (Alexis) with two dogs. To fit into her Nissan Pathfinder we had to strap our dry bags to the roof and I had a Weimeraner sitting in my lap, but Alexis was determined that she could make it work.